For as long as I can remember, Spalding has been a household name in the basketball business. Their good reputation is owed to a couple of reasons, but I would like to point out the ones I feel contributed the most: overall quality of their gear and a huge number of models on offer. Both of these are perfectly reflected in a Rookie Gear model for kids. This is a universal basketball designed for both indoor and outdoor usage, but more importantly, this model represents a cornerstone in a development process of a young basketball player. It is best suitable for kids age 6-9, and it will instill the desire to really start mastering the skills required for a professional career. 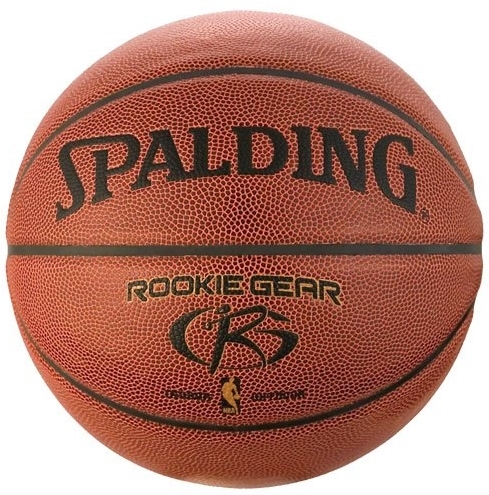 Rookie Gear ball is slightly bigger than the standard 27.5″, and it is approx. 25% lighter than the standard size 5 regulation ball. This affects grip in a good way and makes it easier for kids to develop ball handling and shoot skills. The composite leather provides the right mixture of grip and durability. These features really need to be balanced, especially for universal models used by kids. Even though sweat really isn’t a factor in youth basketball, the wet hand test showed remarkable results, something to be considered for slightly damper courts kids like to play on. The increased size and decreased weight of this Rookie Gear model make for an excellent choice for kids. Spalding specifically designed it for easier shooting and rebounding which is aimed at increasing the confidence and desire to learn. The bounce is consistent even when the ball deflates a bit which can often be a case when it comes to youth basketballs. This, in term, enables kids to better learn the fundamental elements and start loving this beautiful game. The transition from a basic rubber ball to Rookie Gear model really makes a difference, and experience so far showed me that kids simply fall in love with this ball. If you are looking for a first basketball that your kid will take seriously, this model is it. And don’t get surprised if any of the other kids gets one and your child asks you the get him one as well.